Throughout the 1790s heads continued to roll off the guillotines of France as that country struggled to affirm the democratic principles it had first espoused in 1789. Some Americans watched nervously from across the Atlantic and wondered if the violence of the mob would spread to this country. But America's democratic principles were firmly established, as it had already undergone the national trauma of revolution, war, and two changes of government since 1776. By 1798 democracy in America was beginning to come of age. The Draped Bust dollar obverse was designed by noted artist Gilbert Stuart in an attempt to elevate U.S. coinage designs to "world class" stature. This design marked a maturing of the "young" Liberty of the preceding Flowing Hair design to a more "matronly" concept of the emblematic national symbol. In 1798, the young hatchling eagle seen on the reverse of the earlier dollar was replaced with an older and more naturalistic eagle, and one that was more in keeping with heraldic iconography. One oversight in the iconography of the Heraldic Eagle reverse though, was in the placement of the arrows in the eagle's right claw the more honorable placement in heraldry leaving the olive branch in the left or less honorable claw. This more warlike placement of the arrows was repeated on all heraldic eagle coins of the period. During the six years Draped Bust Heraldic Eagle dollars were struck, 1,153,709 coins were produced, all in the Philadelphia mint. There are dozens of die varieties, most involving only a minute difference in the placement of the stars, numerals, letters, or other design elements. But there are several important design changes in the series that are of interest to a wide range of collectors. On 1798 dollars there are two different patterns of stars on the reverse above the eagle's head. The earlier configuration, known as the "cross pattern" was a modification of The Great Seal of the United States, with the stars arranged in two triangular groups of six joined by a single star in the middle. The later design was much simpler. Known as the "arc pattern," it had two parallel rows of stars: the top row had six, the second row five stars, followed by one star on either side of the eagle's head. No one knows exactly why the star patterns were changed, but the earlier "cross pattern" configuration is generally the scarcer of the two. An interesting blunder occurred in the reverse stars in 1799. A working die was produced that had 15 stars, rather than the required 13. The error was discovered before any coins were struck, and rather than discard the die, the clouds were enlarged over the offending stars, covering all but the tips of these extra star points. In 1800 a die was cut that had an extra letter A at the end of AMERICA. The extra letter was polished away, but only the right portion of the letter was effaced, leaving what appears to be a letter I, thus creating the well-known AMERICAI variety. 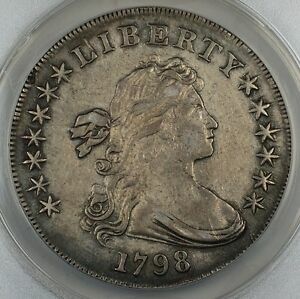 One of the most famous coins ever struck is considered a part of the Draped Bust series, the 1804 dollar. While the Mint struck dollars in 1804, all were produced from leftover dies dated 1802 and 1803, and no dollars were struck with the date 1804. However, thirty years later when several presentation sets of U.S. coins were needed for diplomatic gifts, the Draped Bust design was resurrected and dated 1804, as that was the last year the dollar coin was officially authorized. 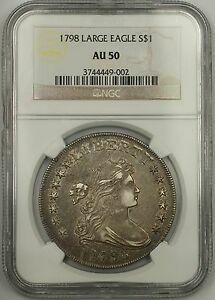 These were the so-called "original" or Class I 1804 dollars. The Class II and Class III 1804s "restrikes" were produced in the late 1850s for prominent collectors of the day. Only 15 specimens are known of all three types. 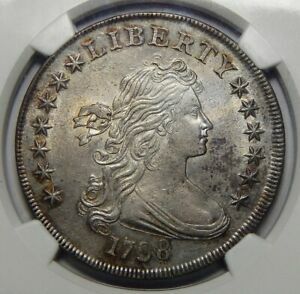 No true proofs are known from this series, but like the 1804 dollar, Mint officials were only too pleased to oblige collectors in later years. Sometime between 1836 and the late 1850s, modern looking proof dollars appeared with the dates 1801, 1802, and 1803. These fantasy pieces are highly prized by collectors. 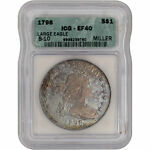 In lower grades Draped Bust dollars are widely collected by die variety specialists. Coins in XF and better condition are usually sought out by those who collect by date and major variety. For type purposes, most collectors want a single, high grade, problem-free example of a common, well produced variety. 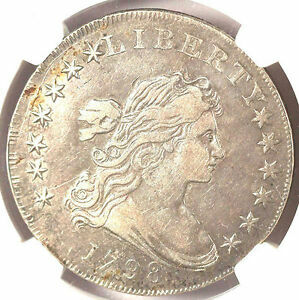 Such coins are quite elusive today, and usually bring a substantial premium when offered. 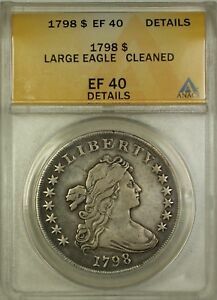 After 1800 silver dollars began to disappear from circulation. Many U.S. dollars were shipped overseas or melted for their high intrinsic value. Dollar production stopped altogether in 1804, and the next generation did not have a current circulating dollar coin until a brief artistic renaissance came to the Mint in 1836, led by Christian Gobrecht. Over the nearly two centuries since their manufacture, the short-lived series of Draped Bust dollars has continued to be one of the most widely collected in U.S. coinage. American Numismatic Society, America's Silver Coinage, 1794-1891, American Numismatic Society, New York, 1987. Bowers, Q. David, Silver Dollars and Trade Dollars of the United States, A Complete Encyclopedia, Bowers and Merena Galleries, Wolfeboro, NH, 1993. Highfill, John W., The Comprehensive U.S. Silver Dollar Encyclopedia, Highfill Press, Inc., Broken Arrow, OK, 1992. Hilt, Robert P., Die Varieties of Early United States Coins, RTS Publishing Company, Omaha, NE, 1980.